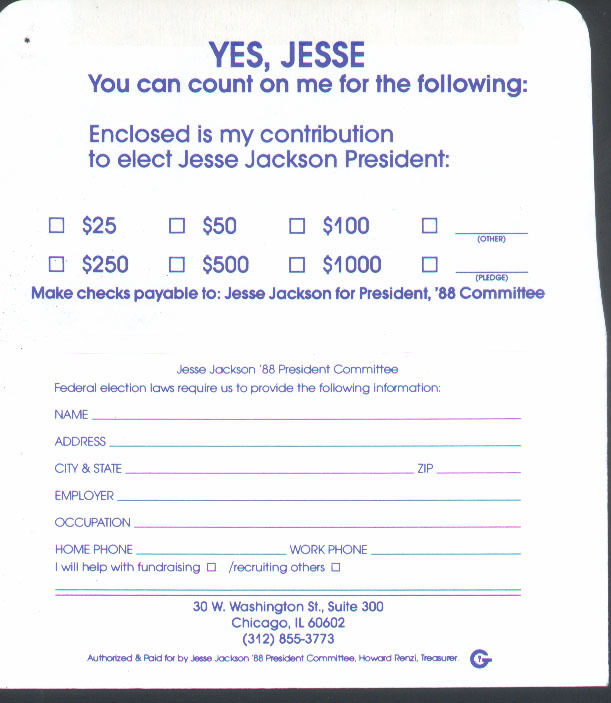 -AS I WAS BORN IN CANADA, LIKE BOTH OF MY PARENTS, I HAVE BEEN WONDERING IF WHAT YOU SEE SUBSTANTIATED BELOW, WHICH WAS SENT TO ME BY THE "JESSE '88" U.S. PRESIDENTIAL CAMPAIGN ALONG WITH WHAT YOU FIND IF YOU TAKE A BRIEF SIDESTEP HERE, IS TECHNICALLY AN ILLEGAL CAMPAIGN SOLICITATION UNDER U.S. ELECTIONS LAW. ALSO ON THE SUBJECT OF U.S. PRESIDENTIAL CAMPAIGNS, THIS YEAR AND ALL THE WAY FORWARD THROUGH THE YEAR 2008 CAMPAIGN (YOU WILL SEE BY ONE OF THE TERMS OF REFERENCE CONNECTING FROM THIS LINK), CONSIDER WHAT YOU FIND IF YOU TAKE YOUR NEXT FOOTSTEP HERE.